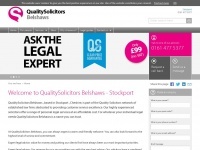 Expert legal advice in Family Law, Wills, Probate, Accidents, Crime and Litigation in Stockport, Manchester and Cheshire. Free initial advice. 0161 477 5377.